Likar spesielt godt samanheklinga di. Veldig fin! this is wonderful and thank you so kindly Mille for sharing it with us all… you have inspired me to go forth and crochet petals like i have never crocheted before. I’m new to crochet, but this sounds like I can do it. I will give a try! This is simply lovely! I’ve been swooning over the same blanket and couldn’t find a similar pattern either. Thanks a million, I’m ready for some quality time with my hooks! I pinned this one too! Thank you so much for figuring it out. My efforts resulted in a mess. I can’t wait to try it! I love this pattern and wanted to make it right away. I have a question though. 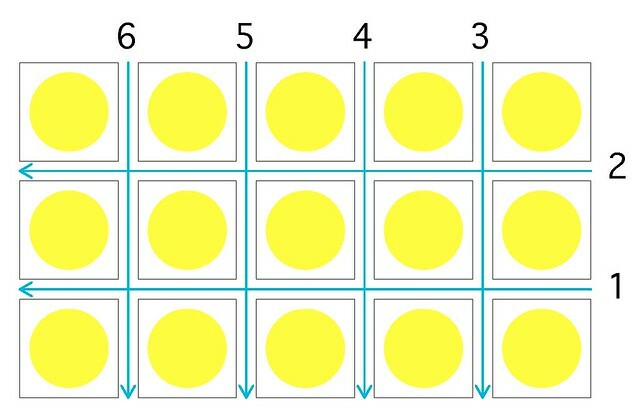 When you are making the first petal in a round, which stitch do you go into after the 5 dcs since there is no chain 3 beforehand (except the chain 3 that represents the first dc)? I started this yesterday and it is just beautiful. The pattern instructions were easy to fill out BUT…..there is nothing about a border. Can you add instructions for that?? What did you use for a border?? Here is a video made by Erin (linked much further below) that shows the square being made step by step. For a beginner and visual learner like me, I needed the video to make Mille’s fabulous pattern make sense. Thank you to you both! I’m a love, love, lovin’ your blog. Thank you for posting for people like me, who love beautiful things! This is beautiful!! Am really looking forward to making this but just cant get it 😦 i know its a lots to ask but would you consider step by step photos?? i hope so!!!! bet i am just being dense!!!!! Im so glad you posted this! I found dotties blog too and was obsessed with it too! I couldnt find a pattern either and had given up! Then i found your blog. Im excited to try it. Thanks so much. Hej 🙂 Question! After round 2, when you’ve made all petals and you’ve just finished the last petal (pull through both loops on hook) – do you right away slip stitch to the third in chain (which is the chain which you make first before starting to make petal 1)? Have you considered doing video tutorials? You are obviously very talented and generous! Hi ,,,,,,,i like this pattern a lot and started to make pillow but i am stuck on petal …….could u pls elaborate a little bit. Sorry for the trouble but i am new to crochet so need little bit of guidence. Yes! I’ve finished a lapghan using this exact pattern and I love it! I am among the throng that was enthralled with that blanket and am so grateful you came up with the pattern. Question though, in the original blanket and in the original one you made, the edging is a bit different — the squares on the ends seemed curved and there is a big gentle scallop around each square. Would you pretty please share how you did that? I’d be forever grateful. 🙂 thank you! I am veryyy new to crocheting and had only attempted very small projects…like hair bows etc..until I saw this! I fell in love with this and had to attempt it! Just like most of you…I got stuck right after finishing my 7 Single crochets! I couldnt understand at all what I had to do next…but I was determined! After a lot a lot of research…i DID it and made my first square!! I am veryyyy happy with the result! So basically,,,the petals that we are making is actually Popcorn Stitch..there is a lot of youtube videos on it…once you figure out the popcorn stitch, you will see it coming through! I have been looking for similar pattern, your pattern gave me the idea of how to start. Thanks for posting this pattern… I’m Loving it ! I would love to try this pattern! It is so gorgeous!! Is there a video tutorial on how to do the “1. one flower petal: 5 dc, take hook off loop, put hook (from front to back) through 3rd chain (the last ch of space before the 5 dc) and the ”loose loop”, yo, pull through both loops on hook.” part? I’m newer to crocheting and I understand most the pattern just not where I’m supposed to take the chain off the hook. If you could let me know that would be great! Thanks so much! This is a lovely pattern, I hope you don’t mind if I link to it on my new blog? Wow this is awesome!! Would love to try it…. Thank you for the pattern. You blanket looks lovely.
. one flower petal: 5 dc, take hook off loop, put hook (from front to back) through 3rd chain (the last ch of space before the 5 dc) and the ”loose loop”, yo, pull through both loops on hook. Can you please post a detailed photo of this or something? It doesn’t make sense at all, because it doesn’t mention anywhere making three chain before starting on the petals?? I’m not new to crochet either!! Thank you!! Please let me know if this is ok with you. Thanks. Certainly not a problem! Feel free to link back to the inspiration 😉 And send me the link to your pattern, so I can check it out! Thanks for sharing this pattern, I have been looking for this pattern for ages – can’t wait to give this a go on some cushions! Crocheting an afghan w middle flower petals in different colors an white border. Love the pattern and working it w I hook. Thank you. When finished I will put a pick on pinterest. 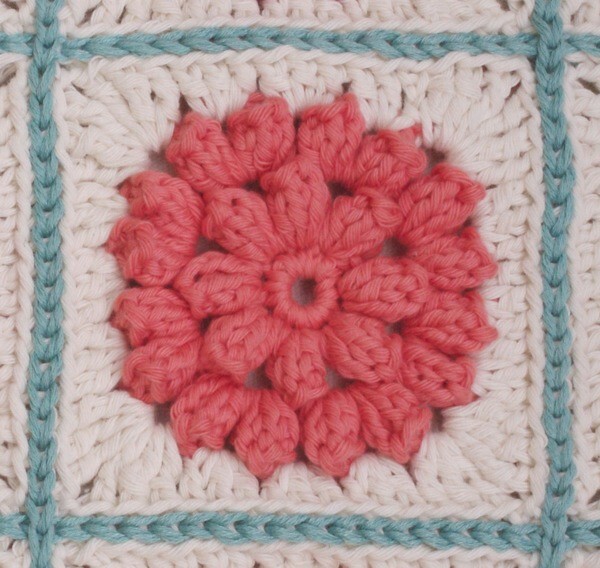 Hi Mille, well you’ve created a beautiful square that is so much fun to make! I made a few cushion covers and I love them. Also, I tweaked the pattern a little here and there. I get a lot of requests for the pattern from my readers and was wondering, if you would be ok with it if I wrote a blog post about them, linking to your blog, and writing the pattern with my little tweaks? Please let me know what you think. The writen instructions are difficult to follow. can someone make it easier? describe how you make the petal please? it’s beautiful and i really want to make it. I think i’m getting it w/out the pattern Thank you anyway. Isn’t it funny how it only takes asking the question…and then you figure it out on your own? 🙂 I thought I had tried everything…I was missing that key point, front to back on both squares. Got it now! Thanks for sharing the pattern! I’m having trouble with the same thing! Could you clarify in a little bit more detail how you’re supposed to do it? Thank you!! I’m having trouble with joining the squares as well. Could you explain what you mean by front to back on both squares? I think I figured out where I was going wrong: make sure the ball/length of yarn you’re working from is UNDERNEATH the blanket when you are joining. It was so frustrating not knowing what the problem was! What brand of yarn is that??? Thank you! I was just about to work up a pattern to copy the same blanket I saw on pinterest and now I don’t have to! Saved me time! Will u do a video instruction soon? I LOVE this pattern, it is so gorgeous! And so easy to work!! Thank you so much for this beautiful pattern!! This is such a beautiful pattern and I cannot wait to try it out. There are so many possibilities for projects. Thank you so much for sharing. j’aime beaucoup ce granny, mais je ne sais lire que les schémas. I have just made up a little baby blanket with this patter.. its fantastic!! in “something pretty – the pattern | mille makes�”. Thanks a lot for pretty much all the actual information. Hello Mille, I love your Something pretty blanket. Love it. I am a newbie and would love to try and make it. I would like to use 3 shades of pink, 2 shades of lavender, 2 shades of blue and maybe some green. I would like to make the blanket for on the back of my sofa so maybe the size of a single bed. How much yarn do you think I would need??? Do you have any Photo tutorial on how you made the Something Pretty Blocks??? I read that someone suggested using a crochet hook larger than the yarn called for??? Would you suggest this do. Can you maybe make a fototutorial or videotutorial of it? I am Dutch and I don’t understand it very well, unfortunately. I tried it, but it doesn’t even look like I did it right. I love this pattern – thanks for a great tutorial! Thank you for this great post and pattern! I used this pattern to make an afghan for my new granddaughter and linked to this post on my blog at PatriciaFisherDesigns.com. I love the way it turned out, thanks again! Make sure the yarn you are drawing from is underneath the work at all times. So you go down into the back loop of the first square, then down into the back loop of the second square, yarn over, then draw through all three loops. Hope this helps, I struggled for quite a while before I figured out where I was going wrong. Totally in love with this pattern too. Recently took up crochet after not doing it since childhood. Forgot how much i like it. I was wondering if i could link to this blogpost (and other blogposts) when i write about it on my own blog and if i could post a dutch translation of it. THanks for the bunches of inspiration ! i just finished the first of 2 of the blankets! love it!!! I’m working on a kind of hodgepodge granny/square afghan for my daughter, bunch of different colors and stitches, lots of crazy colors. I was wondering to increase the size of this square to 7 or 8 inches would you just follow the pattern by putting two petals in every 3 ch space around? I ‘m having diffuculty with the pattern as well, I’ve noticed I’m not the only one but the owner of the pattern doesn’t seem to be answering any of the questions… for those of you who found the pattern easy to make can you elaborate a bit? I’m just confused about how to make the petals. I literally cannot find a similar pattern anywhere! so this one is all I have to go by! thanks! I hope I can manage as have never crotchet anything complicated. I have a request. Can you create a you tube video for this pattern? could you make a video of making a petal? or the first 2 rounds? Thank you so much for figuring this pattern out! I also saw it on Pinterest and was really sad that there was no attached pattern. I can’t wait to be done my other projects so that I can start working on this one. PLEASE HELP.I am stuck on Round 3. Cannot understand this round.Instructions are confusing. A video would be more helpful. Love this pattern! I am making a pillow and had one question… wat did you do for the back portion? I don’t have a sewing machine so was wondering if you had a pattern for the back. Oh and also did you use a pillow or stuffing? Thanks in advance! Thank you so much for this great pattern! The instructions were clear and easy to follow; I was looking for something nice to do with leftover yarn and wanted something more than just plain granny squares; just finished the first square and it turned out just like the picture (wish I could say that for some of the cooking recipes I’ve tried 🙂 ). Thank you so much; love it! Also I think I misspoke……. I meant sets of: 3 DCs, then two sets of *3* TCs. Repeat. I was confused about the same steps at first. You have 16 chain3 loops. You do THREE sets of 3dc (in the first, second and third loops) then two sets of tc (with two ch between sets) in the fourth loop (this makes the first corner). Repeat three times to work in all 16 loops. This is wonderful, can’t wait to make it. You are so creative!!! STill can’t figure out the petal instructions with the removal of the hook and front to back.. I am a more visual person.. can you please put pics on what you mean or video tutorial? Hi, I noticed a lot of requests in the comments for a video tutorial. I understand the pattern pretty good and I have been wanting to try to start making video tutorials. Would it be OK if I tried to make one for this pattern to post to YouTube? Erin I have hoping that someone would put a tutorial on you tube since I found this adorable patern! PLEASE let us know when it is up and how to search for it! Thank you Thank you!!!! Hello again Erin just wondering if you have thought more about doing a you tube tutorial for this pattern. I’ve been searching I’ve comd to something close but it’s not tge same. Hopefully you get something up! I know a lot of us would really appreciate it!!!! Yes I am still wanting to make a tutorial. I’ve had the flu all week though so I haven’t gotten to it yet. I’ll comment on here with a link when its up. OK, I have a tutorial for this pattern up. I hope it helps! Using the popcorn stitch tutorial and reading it over several times I was able to figure it out. Thank you for a beautiful pattern! What are the names of the colors of yarn you used? Thanks this is just what I was looking for for my Mother’s Day cushion! Lovely job! This was featured in an MNE Crafts round-up! How does this make a square? Repeat around to, ends with 2 sets of 3dc, then join. This looks so beautiful! I saw it done in blue and white…just beautiful. I would love it if there were vidios I am a newbie and would love to learn how to crotchet. Thanks for the motif. I took the center part & used it for making scrubbies. Looks great done in tulle & cotton crochet yarn. New to site…love this pattern…..how do I print it out? Love this square its so pretty was told it works up fast. After making the circle it says to make 7 SC but then later says 8 petals. Curious how to fit 8th petal in? Do you have a video for joindre part ? Can I make a cope of this pattern on PDF?